the inner corn bag holds the corn - we don't use popcorn, so there is no concern that you will end up with a fluffy bowl of popcorn when you heat your warmer for the first time! the outer decorative cover fits over the inner corn bag - this is what gives your warmer personality!! The outer cover comes in many different patterns to choose from for your microwaveable heating pad cover - visit our Fabric Gallery where you can select from over 125 different patterns to choose from! 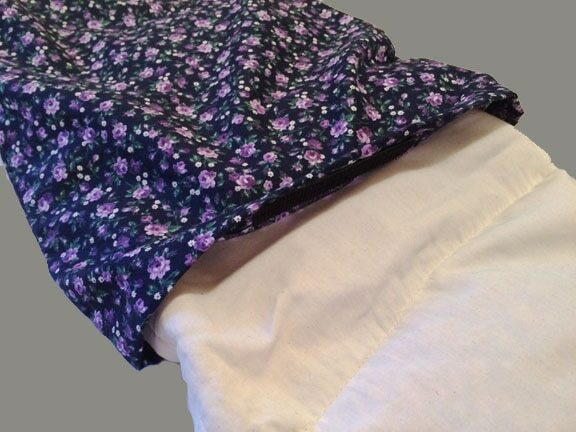 You are sure to enjoy our microwave heating pad for Many Years because you can wash the outer cover in the washing machine when it loses that fresh look and feel. By using an inner and outer bag, you will find that our Corn Bag Warmers are simply the most comfortable you can buy! One thing that makes our microwave corn pillows unique, is the fact that we put Velcro ® across the opening of every outer decorative cover. The Velcro ® holds the inner corn bag in place regardless of how the warmer is turned. This eliminates the aggravation of the inner bag always falling out. We pioneered this solution back in 2001 and are delighted to say that it is still the best solution on the market!